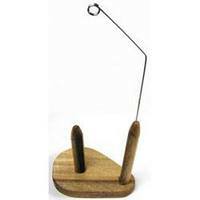 When used properly, this thread stand will become your favorite external thread stand. Use it for sewing or winding bobbins. 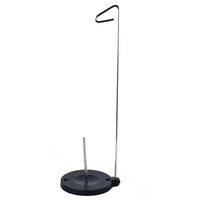 Spools or cones of thread up to 76mm (3 inches) in diameter will fit on this thread stand. 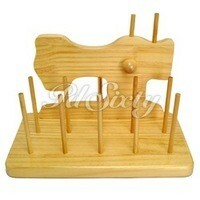 Now you can sew with all those threads that will not fit on your sewing machines spool pin. Proper thread handling is very important to your sewing machine. Any obstruction to the thread flow from spool to needle can cause problems, such as broken needles or inconsistent stitches. 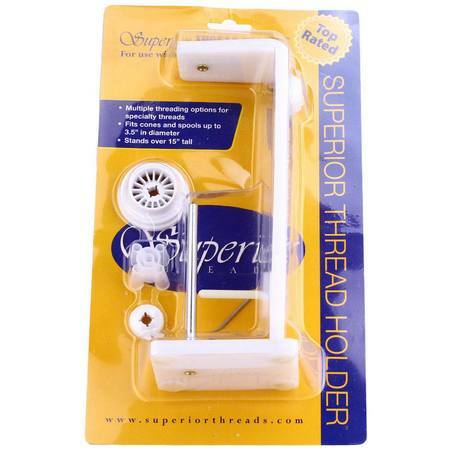 These problems are inconvenient and can be reduced when using the Superior Thread Holder. There are 2 spool caps and 1 cone adapter included. These are used specifically for different types of spools. The idea is to keep the spool from turning while allowing the thread to spool off with no resistance. The small cap is intended for small diameter spools. Note that the spool is the plastic core that the thread is wrapped on. The larger cap is for medium to large spools. The side placed against the spool should be larger than the spool itself. This way the thread spools off on the edge of the cap, NOT on the edge of the spool. When pushed all the way down on the spool they prevent it from turning as well. The cone adapter is used for cone type threads where the opening is about 25mm (1 inch). It is a snug fit on the steel pin so as not to slip off when removing the cone. For most cone type threads the adapter need only be installed flush with the end of the spool pin. Wiggling the adapter while installing or removing makes the process easier. The cone can now be held in place allowing the thread to spool off to the exit hole. The 2 spool caps can be mounted on the spool pin (at the bottom of the cone) for storage. After securing the spool or cone the thread must pass through the exit hole opposite the spool pin. At this point the thread is free to go wherever you would like. The guide wire keeps the thread clear of a cluttered sewing table. 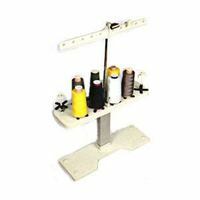 When placed vertically with the guide wire extended up, it stands 15 inches tall, clearing the tops of most sewing machines. As with any external thread holder, care should be taken to keep the thread clear from obstructions or moving parts.